April 9, 2014 - Today, Bertrand Piccard and André Borschberg launched Solar Impulse 2, their new single-seater solar aircraft designed to take up the challenge of the first round-the-world solar flight, without any fuel in 2015. 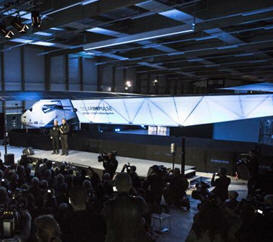 Solar Impulse is the product of an alliance between two men to fulfill a project deemed impossible by industry experts. While Bertrand Piccard, a psychiatrist and explorer, sourced partners to finance the project and promoted the cause for clean technologies (subsequently endorsed by many political authorities), engineer and entrepreneur André Borschberg brought together and led a technical team of 80. It has taken 12 years of calculations, simulations, construction and testing to arrive at today’s launch of Solar Impulse 2 the most revolutionary aircraft of out of time, set to fly around the world. “A vision counts for nothing unless it is backed up by action. With 8 world records for Solar Impulse 1, the first solar aircraft capable of flying during the night, crossing two continents and flying over the United States, we have shown that clean technologies and renewable energies can accomplish the impossible,” said a delighted Bertrand Piccard, founder and Chairman of Solar Impulse. The single-seater solar aircraft has a huge wingspan of 72 meters (236 ft) for its weight of just 2,300 Kg (5’000 lbs. ), producing an aerodynamic performance and energy efficiency greater than anything to date. There is a 3.8 m3 cockpit, every detail of which has been designed for a pilot to live there for a week. However, for the sake of maximum energy efficiency, the cabin is not pressurized or heated – a further endurance challenge for the pilot. Test flights are due to take place in May, followed by training flights over Switzerland. The attempt to make the first round-the-world solar-powered flight is scheduled to start in March 2015 from Gulf area. Solar Impulse will fly, in order, over the Arabian Sea, India, Burma, China, the Pacific Ocean, the United States, the Atlantic Ocean and Southern Europe or North Africa before closing the loop by returning to the departure point. Landings will be made every few days to change pilots and organize public events for governments, schools and universities.